Unhinged! 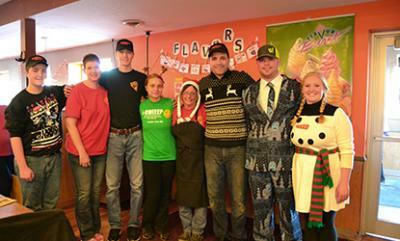 Pizza owner Jason Zehnder, staff members and volunteers gave their time on Christmas Day for a free holiday buffet. Zehnder estimates that more than 1,000 were served. A freewill donation was accepted, as well as nonperishable food items which raised $4,600 and collected 571 pounds of food for the McLeod Emergency Food Shelf. This is the third year Unhinged! Pizza has hosted the event.